NCT Antenatal Classes – An honest opinion! I thought I would just do a little post for my pregnant readers on the National Childbirth Trust antenatal classes. I know lots of people procrastinate over whether or not to invest the money in these classes, and that there are a lot of divided opinions on what they are like and who they are for. So having attended our antenatal classes I thought I would share my experience. First up I haven’t given birth yet, so I honestly can’t tell you whether they help with that or not! I do feel quite relaxed at the moment about labour and birth, mainly because I’m massive, it’s hot and I’m fed up! I can tell you, that the information given on the course, I feel, has also helped me to feel a little more relaxed, and a little more prepared for every eventuality! 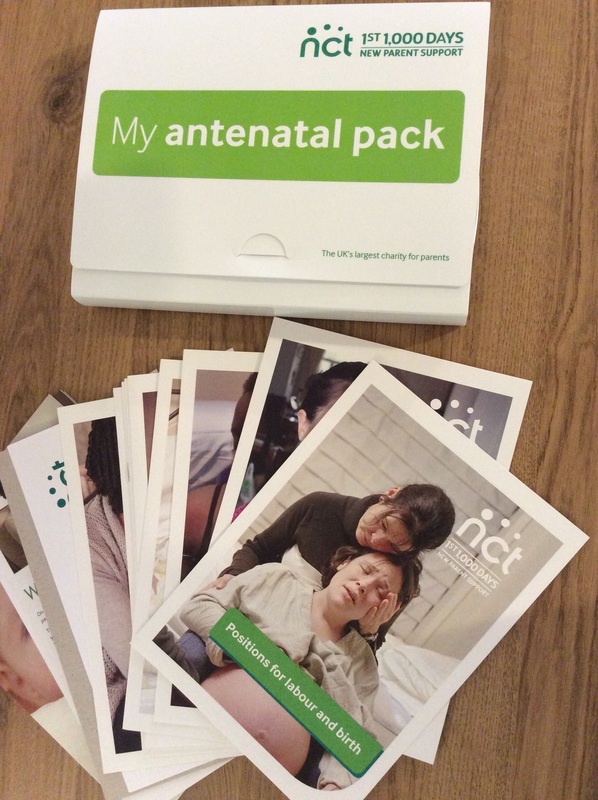 My husband and I took the plunge and booked the NCT Signature Antenatal Course. You book based on the month you are due, with the course usually being a month or two months before your due date. The duration of the course varies, our version was a whole weekend, half a Saturday and then a reunion once we’ve all had our babies. The cost of our course was £170 (June 2015). There were ten couples on our course, I won’t give any more details other than that, as what is said in the room needs to stay in the room and I wouldn’t want to say anything that could be attributed to individuals. Our tutor had children of her own, and was a fully trained NCT course leader. She wasn’t a midwife or healthcare professional. The first day was all about feelings and preparation for labour. Yes we did do some ice breaker stuff, but it wasn’t excruciating! We talked about what we wanted from the course and the general consensus was that we wanted more post birth stuff than labour stuff! So our course was tailored to the group. We learned about labour and birth, from every angle – literally! We did a really good exercise to demonstrate the number of people in a room if you have a C-Section. Lots of the exercises were really useful, there was loads of time to work as a group and to meet and chat with each other. Lunch was a bring your own type arrangement, and on day one there was no pressure to eat together, although my Husband and I and two other couples did. The second day was a sharing lunch, but most people brought their own, and we all sat together. The second day we covered more about coping with a crying baby, post natal depression, positions for labour and nappy changing! If you decide to take an NCT class the chances are you will cover different things, as they seem to be quite tailored to the needs of the individual group. The third morning was led by a breast-feeding councillor. It sounds utterly horrific to talk about breast-feeding for three hours, and to be honest I really didn’t want to go, but it was useful and actually made all the more useful by one of the couples having had an early arrival and bringing their new baby along! Meeting a tiny new baby was actually the highlight of the course, and being able to ask very frank questions of very new parents made this session brilliant! We got lucky here I think! My Husband and I spent a good two hours of the session staring at someone else’s bundle of joy and grinning inanely at each other!! Ok, so those are the practicalities, now what I really thought! Course Leader – both the course leader and breast-feeding councillor were really good. They were very knowledgeable , interesting and fun people. They were a pleasure to listen to. The other parents to be – ok so I don’t think we’ve made any friends for life. And yep one couple really annoyed us (!) and another deserved a few eye rolls. But generally the group was very friendly, very interesting and on the whole quite normal! In terms of age range we were all about the same. I had heard people say that at 35 they were the youngest in the group on some mum to be forums, but I’d say we were all around 30. Generally the group was made up of middle class, professional types, so no myths dispelled there! Awkward moments – yes the ice breakers are awkward. If you don’t like public speaking the worst part is introducing yourself to twenty people. You don’t have to throw yourself into group exercises and perform on a stage or anything! Best bit – the best bit was meeting the first baby of our group! Now this is unlikely to happen to you! We got seriously lucky, and while this little new person was early (very slightly premature) and spent their first week in hospital, they were doing great and did a fantastic job of making us all think, actually this isn’t going to be so bad! Better than any professionally trained course leader ever could! The other best bit was the positions for labour and associated massage techniques for your birth partner (Hubby has had to practice these a few times!). Worst bit – I’m not sure this merits a worst bit description, but our course did at times feel like we were being told the worst possible outcome of pretty much everything! I like to be prepared and I like to know what can go wrong, as it seemed, did the rest of our group. I think knowing the worst can help prepare you. But just be warned if you want to talk about ‘normal’ births, and kittens and flowers, you will not get that! Overall? If you’ve got the money and are keen to meet other parents to be, don’t hesitate get yourself on a course. Equally if you want more information, want to talk about options with an independent person, want to explore what might happen or could go wrong, it’s a great course. It’s expensive, but being totally honest for my Husband and I, it was worth it.